In recent time, Dentistry has been doing great by improving technology and dental materials used for dental fillings. Today, we are going to discuss four main materials used in dental clinics for fillings and their properties, advantages, and differences between one another. What requirement for successful amalgam filling or restoration? What are the techniques of amalgamation? What is the equipment required for silicate fillings? What is the equipment required for composite fillings? Amalgam is a dental fillings and silver-colored in nature and there has been popularly used a long time ago. It has been in existent since 1960s also. Amalgam is made up of a metal alloy of mercury, silver, tin, and copper. It begins as a soft filling material that is used to fill class I, II, and V cavities in posterior teeth and hardens over a short period of time. When amalgam filling is mixed it is picked up in a special carrier and handed to the dentist, who places it into the tooth cavity. He/she presses the amalgam into place with mechanical amalgam plugger or amalgam carrier, ensuring close adaptation to the cavity walls and bringing excess mercury to the surface. After a short period of time, the filling the surface is polished with amalgam finishing burs or ball burnisher, Abrasive strips and discs, brushes, pumice, and glycerin, or zinc oxide in alcohol, to ensure a final smooth finish. Carving is very important during amalgam fillings because it helps remove excess amalgam and restores the tooth to its original anatomical form, this being best for maximum functional efficiency. Formation of a marginal ridge prevents food from reaching and damaging the gingivae. Carving also attains a level joint between tooth enamel and amalgam. If this were not done food would catch in this region, stagnate, and lead to recurrent decay, as well as gingivitis if at gum level. Use the correct ratio of alloy and mercury according to the manufacturer’s instructions. Immediately pack into the cavity. Condense with heavy pressure to ensure the removal of excess mercury. Carve to the correct anatomical form. Polish to ensure a smooth surface, with no edges between tooth and amalgam. Posterior fillings where aesthetics are of less importance. Anterior fillings in mouths highly susceptible to caries, where other materials are rapidly attacked. Amalgam alloy and mercury are mixed (amalgamated) prior to use. Silver: strength, color, correct expansion. Tin: ease of manipulation, increased flow, slower setting time. Copper: hardens, increased setting time. Zinc: increased dimensional stability, ease of work. It is essential to use the correct proportions of alloy and mercury in accordance with the manufacturer’s instructions otherwise incorrect properties will be obtained. 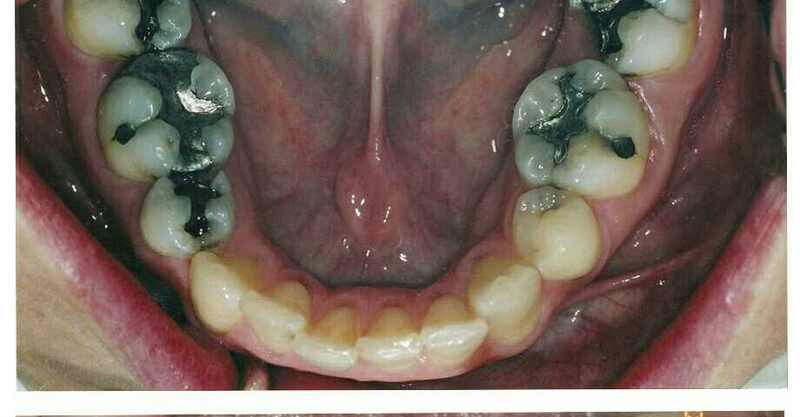 Excess mercury causes weak amalgam with excessive expansion. Insufficient mercury causes brittle amalgam, rapid setting, lack of plasticity, and excessive contraction. It is therefore difficult to handle and pack into a cavity. Trituration of alloy and mercury with a pestle and mortar or Amalgamator until the silvery mass clings to the side of the glass mortar, ln case of Amalgamator the pestle should be held in a ‘pen grip’ and put inside the Amalgamator and mixed. By kneading them in a thick rubber finger stall. By vibrating them in an automatic Amalgamator, for which purpose the constituents may be obtained pre-dispensed in capsules. Under no circumstances should the material be allowed to contact the skin. It has been known that it could cause dermatitis. Moisture from the skin, for example from saliva, leads to expansion of amalgam. This, in turn, causes pain, due to pressure on dentine overlying the pulp. Expansion out of the cavity leads to the formation of food retaining edges, resulting in secondary or recurrent caries. Water also causes a lower strength. Source: “Dr. Gary Walton” – under creative commons license. Amalgamator or pestle and mortar. Silicates are used to fill Class III and Class V cavities, and to face gold inlays in anterior teeth. Although aesthetically superior, they only tend to last three or four years. Whenever possible a rubber dam is applied to the tooth prior to inserting a silicate filling, as the latter is weakened and discolored in the presence of moisture. A lining is always placed over exposed dentine to prevent free acid in the silicate cement from irritating the pulp. For silicates, the matrix takes the form of a celluloid strip, which may be held in position with a special clamp. Silicate is placed into the cavity with a plastic instrument and a strip lightly smeared with petroleum jelly is used to compressed it tightly into position. After the filling has set hard the strip is easily removed, the petroleum jelly acting as a separating medium. Excess material is removed with a scalpel blade and white stones smeared with petroleum jelly, and a coating of varnish is applied. This stops uptake of moisture and stains before the final set has taken place. After twenty-four hours the filling is polished with fine stones, Disks, And strips, all greased with petroleum jelly. Semi-permanent restorations in the front of the mouth as the color and translucency match the natural tooth substance. Silicates consist of a liquid and a powder. The powder is composed of silica, alumina, Flux, lime, zinc oxide. The liquid is phosphoric acid, water, aluminum, and zinc phosphates. The liquid rapidly takes up or gives off water according to the humidity (water content of the atmosphere). It is important that the bottle should be kept tightly stoppered when not in use, as changes in water content affect the setting reaction. Unfortunately, silicates are not long lasting. Some are supplied in pre-dispensed capsules. In this case, the liquid is contained in a membrane, which is ruptured just before use, by squeezing in a special press. This brings liquid and powder into contact, after which they are mixed in a mechanical mixer for about 10 seconds. A thick glass slab is cooled with cold water and dried. Thick glass retains the coolness for a long period of time, allowing a longer mixing time. The required quantities of liquid and powder are placed on the slab. It is important to hold the dropper vertically to ensure that the correct amount of liquid is dispensed. The powder is divided into four sections, each approximately half the size of the next section. The largest pile of powder is speedily mixed into the liquid followed by rapid addition of the other three sections until a dough-like consistency is obtained. A maximum quantity of powder added in this way gives maximum strength and adaptability. As soon as setting begins, manipulation music is stopped. An agate or bone spatula may be used. A special glass slab is kept for silicates. Remnants of other materials could contaminate and interfere with the durability of silicate fillings. As silicates are affected by moisture, a rubber dam is often placed on the tooth before inserting the filling. Silicate mixtures are acidic and would affect the pulp if no lining were used. Rubber dam, clamps, forceps, punch, frame. This kind of filling is very popular and commonly used in today’s dentistry, composite resin is made up of glass particles mixed with an acrylic resin. These are used for class III and v fillings, and for restoring fractured incisors. Prior to filling, the cavity is lined, but not with zinc oxide Eugenol, as this stains composite and inhibits it’s setting reaction. Enamel around the edge of the cavity is etched with a 50 percent solution of phosphoric acid, to aid retention. Composite is packed into the cavity with a plastic spatula and a polythene matrix band or crown former is used to hold materials firmly in place for about two minutes. The matrix is then removed, and excess material is cut away with a sharp blade. Normally, a handheld “curing” light is used to set, or harden, the material once it has been placed. This gives the dentists a more working time for shaping and placement than other filling materials. Ideally, no further excess should remain, but if necessary further material can be removed after six minutes. Diamond, carbide finishing burs, greenstone, and zirconium strips are all used. Finals finishing is done with fine silicone carbide paper barked discs and white Arkansas stones, using water or a special lubricant. Restorations where aesthetics is of prime importance. Polythene matrices and crown formers. These are a very strong, tooth-colored material. At dental office, porcelain fillings are either made by preferred laboratories. CEREC porcelain dental fillings can be fabricated and placed all in one visit, on one day. Porcelain filings can be dearer than amalgam and composite resin due to its superiority in certain dental fillings and the technology required to fabricate them. For check-up and diagnosis, you can visit the dentist near you to discuss which of these materials is best suited for you. Ideally, The decision is based on your overall oral health and what material will be best suited to the type of work needed, both for restoration to optimum function and appearance. How Does Oral Hygiene and Dental Health Affect Fertility?